Carlyle Dental offers dental bridges for residents living in Kinston, Goldsboro, Greenville and the surrounding areas of North Carolina. A fixed dental bridge is a restoration process that uses a type of prosthetic appliance to replace missing teeth, which improves functionality and enhances appearance. This type of crown spans the empty space between one or more teeth and prevents adjacent teeth from drifting, reducing stress on the dental arch. By creating a normal tooth structure, decay in difficult areas is prevented, and the onset of periodontal disease is inhibited. Proper speech and the ability to chew normally are restored, and the shape of the face is maintained. Dental bridges in Kinston, NC and Greenville, NC can be made of several different materials, including ceramic or porcelain that is fused to a metal, such as gold. However, different types may be used depending on the patient’s specific needs and goals, as well as the locations of any missing teeth. The natural color of ceramic is better suited to missing front teeth, while the stronger porcelain and metal is more appropriate for replacing teeth toward the back. 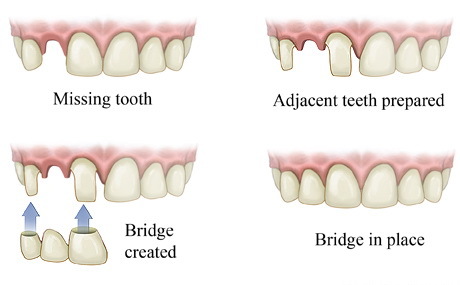 The bridge also has abutments on either side which provide support, and are created from the adjacent natural teeth, or by using dental implants. If you have one or more missing teeth, these gaps can cause the remaining teeth to shift, which can ultimately impact your ability to bite, and increase your susceptibility to gum disease or temporomandibular joint disorders (TMJ). Carlyle Dental offers dental bridge implementation in the Kinston, NC and Greenville, NC in just two sessions. After carrying out an assessment during your first visit, the teeth on either side of your gap are prepared for use as an anchor, or abutment, for the bridge. At this time, the teeth may also be fitted to accommodate a crown or an implant, and may be re-contoured and shaped. Impressions of the teeth are made and sent off to the lab, and a temporary bridge is inserted, which will be removed when the permanent bridge is complete. The new bridge will then be properly fitted, adjusted for contour and aesthetics, and bonded into place. Dental bridges can be a lifetime solution if they are properly cared for and good oral hygiene is practiced. How Much Do Dental Bridges Cost in Kinston, NC? The cost for dental bridges varies and depends on the extent of treatment necessary. We accept cash, MasterCard, Visa, and personal checks. Insurance is accepted, and we also have financing available through CareCredit® and Compassionate Healthcare Services®.